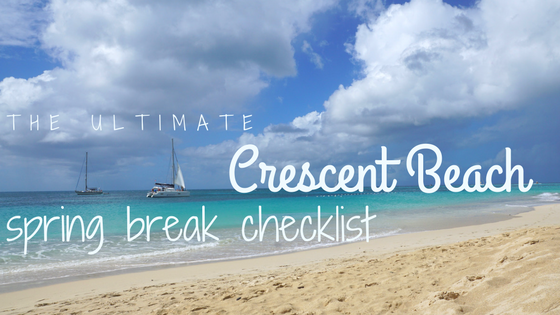 So you’re headed down to Crescent Beach for spring break, and it’s time to start packing your bags. Before you go, make sure you run through this checklist one last time just to be sure you don’t leave any essentials behind! We all know the last thing you want to do is go shop for essentials once you get here. You’ll definitely want to be prepared for whatever spring break brings with the proper toiletries, so let’s work on that next. Body wash that will restore your skin after days in the sun and hours in the salty water. If you really feel you need it bring your makeup. But once you get that sun-kissed glow you’ll find you won’t need it. It’s a Florida thing and you’ll love it. Portable phone charger – solar chargers are the best for this. Pair of shorts and t-shirt and for the ladies a sundress or bathing suit cover in case you want to run into a store or restaurant for a quick bite to eat. Don’t worry about having beach hair. It’s a daily thing around here and everyone is used to it. The toiletries and accessories you will need to add to your beach bag would be the body spray in case you dash into the restaurant for a bite to eat. Your sunglasses and hat to help shade you from the sun and a hair tie if you have long hair, due to the wind and you may want to put your hair up to ensure you get your back sun-kissed as well. That should be enough to get you through most of the week on the beach without a problem. Once you’ve checked everything off of this list, you should be well on your way to having a blast in Crescent Beach. Nothing can stop you from soaking up the rays and enjoying the beautiful sites of the beach when you have all of your essentials. Get ready to enjoy the beach like a local!! !